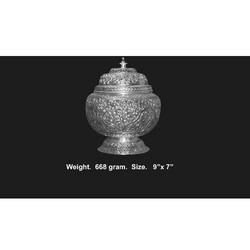 Providing you the best range of white metal duck glass bowl, bharat handicrafts gold plated swan tray duck bowl platter, designer silver plated fruit bowl, white metal fruit bowl, white metal oval fruit bowl and silver plated oxidized dry fruit serving tray with effective & timely delivery. We are manufacturing Gold Plated Swan Duck Bowl and more Decorative and Religious Items in fine hand carving work in Oxidized Silver and Oxidized Gold finishing. Our firm is the among most prominent providers of Designer Silver Plated Fruit Bowl which are widely used for serving snacks and fruits. 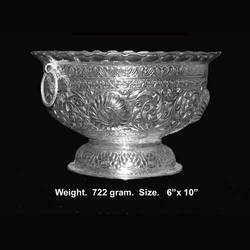 We offer these bowls in varied dimensions and customized specifications with an excellent silver finish. Manufactured from top quality factor inputs, our products finds their applications in residential areas, restaurants and hotels for the dinning purpose. Customers highly prefer our range for its unblemished sheen, low maintenance cost and color resistant. 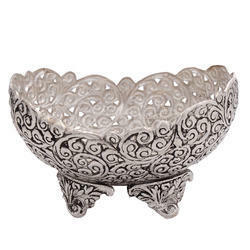 Owing to the proficiency in this domain, our firm is presenting a wide assortment of elegantly designed White Metal Fruit Bowl. 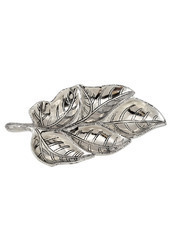 The offered range is specifically designed by making use of high grade pure silver material at par with the prevailing market trends. Widely used for serving fruits and snacks in different sectors, our bowls are apt for the gifting purpose also. We offer this range at industry leading prices in diverse specifications for meeting the requirements of the clients. We are manufacturing an exclusive range of white metal decorative items. We are manufacturing bowls and many more items in several shapes and sizes. 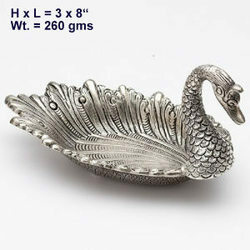 We are manufacturing Silver Plated Dry Fruit Trays, Platters and many more Silver Plated Handicrafts Items. Bharat Handicrafts are a coveted firm engaged in the business of Wholesaling, Manufacturing, Supplying and Exporting a quality assured gamut of Silver Plated Cow Stand, Silver Plated Ganesha Wall Hanging, Silver Plated Ganesha Wall Hanging, Meenakari Elephant Statue, White Metal Fruit Bowl and Designer Jewelery Box. Apart from this we also offer Decorative Silver Plated Table Lamp, White Metal Ganesha Statue, White Metal Ganesha Statue, White Metal Ladies Purse, German Silver Handicraft, White Metal Jug and White Metal Fine Surahi. All our offered products are manufactured by abiding strict industrial guidelines and set quality standards at par with the specifications furnished by the customers. Owing to the optimum quality and diversified features of our range, we have established a wide client base in South / West Africa, East Europe, North Europe and South / West Europe. White Metal Fish Shape Serving Tray offered comprise quality finish based white metal serving trays.